Birthday parties aren't just for people anymore. Pet owners are celebrating big milestones with all of the fanfare that comes with it: decorations, favors, presents, outfits. Some even rent out a venue. And of course, there's the cake. 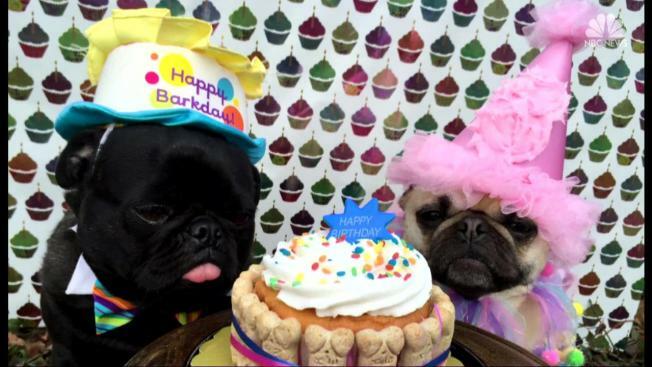 Burg's bakery specializes in personalized "pawty" cakes, and business is booming. Millennials in particular spend an increasing amount each year on their furry friends. Perhaps one reason is that many millennials see pets not as companions, but as starter children. Forty-four percent view pets as practice for the real deal, which could be enough to drive millennial pet parents to invest more time and money into finding organic food or building a doggie wardrobe.